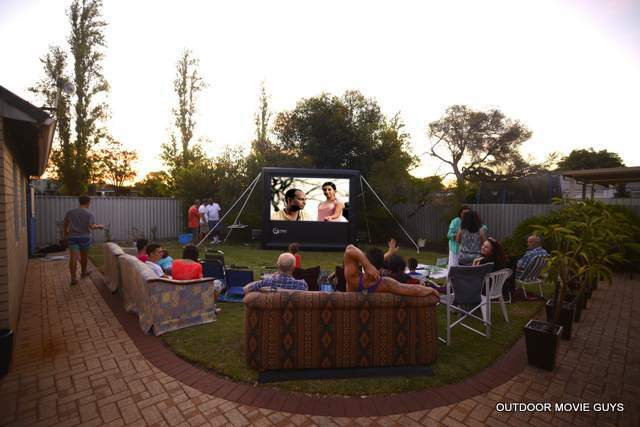 Offer outdoor movie events and backyard cinema for rent – you’ll be surprised how rewarding this idea is! There are hundreds of party hire businesses in Australia, and their services are in demand. Mums love throwing parties for their kids’ birthdays; companies organise Christmas parties for their employees. On top of that, weddings, big family gatherings, or other special occasions for different groups of people need to rent equipment for their events. There is a standard list of offerings available from party hirers, from chairs and marquees, to jumping castles, balloons and party decorations. However, successful party hire business is the one which finds unique ideas to stand out from the crowd. Photobooths, slushy machines, dance floors are some examples of the unique offerings. 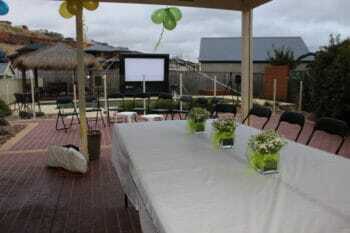 One of the exciting yet easy to implement ideas is to offer outdoor movie events and to organise backyard movie parties. What do you need to have a successful outdoor cinema party hire business? Mums hosting a big birthday party would appreciate if they don’t have to spend time setting up the equipment. Set up everything for them. Ensure cabling is safely tuc ked away and the projector is placed behind the screen for safety of little viewers. Companies organising corporate events need more than just equipment – they need complete entertainment package. Prepare games and prizes and offer catering. Sport supporters need live TV – check if the party place has good TV signal. Offer set top box to connect to the projector so that they could watch their favourite game live. Every market has the best promotional channels to reach them. Reach mums and dads of school kids via adverts in school newsletters. Use Facebook ads to target the neighbouring suburbs. In addition, leverage the search engine optimisation power of Gumtree. Regularly update your website and be seen on Google local and Google maps. Don’t be shy and ask your clients to review your party hire business on social media. Reviews on directories like Yelp, Truelocal, WOMO and HotFrog are also very important – social proof helps others make decision to rent outdoor cinema from you. Quality product will last longer and won’t disappoint. Poor quality inflatable screens can have problems with air leakage; stretch screens take ages to erect; low quality screen fabric will give nothing but disappointment. Moreover, cheap projectors will not provide decent quality image – do your homework and find out actual resolution and brightness of the projector in ANSI lumen before buying. If you are planning to ship your equipment to customer, you would need as few packages as possible. 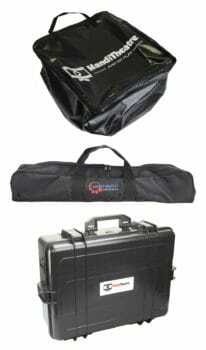 The equipment needs to be simple to set up and operate. In other words, you need fail-safe equipment, supplied with clear instructions. A good instructional video is always a plus. Size matters. Smaller screens can be taken indoors if the weather turns for the worse. Bigger screens create bigger WOW-reaction. However, the most important is the size of the audience – 2.5 metre screen is enough for a group of up to 50 people, while 4 m wide screen is enough for 350 people. Smart Digital Australia offers special packages for party hire business – contact us for pricing and more details. Having big variety of party hire equipment can be very daunting, especially, if you are just starting a new business. Consider to cooperate with other small businesses specialising, for example, on catering, bean bags, or popcorn / slushy machines. This will allow you to offer complete packaged experience for your clients. If you are an established business, package your equipment to match the needs of different market segments. Have rental fees, terms, conditions and penalties available on your website. Have a documented plan for weather cancellations. Prepare a check list documenting all equipment provided to the customer, including small items like cables. Also, if you are shipping the package to the customer, provide return shipping label for their convenience. Be reliable, punctual, and pleasant to deal with. Dedicate time to promote your business online, but most importantly, provide good quality services – people will talk about you and recommend to their friends and neighbours. Backyard movie nights bring lots of fun, and can have many entertainment options and ideas within. Offer themed movie parties with dress-ups. Add Photobooth to take photos of the guests in costumes. 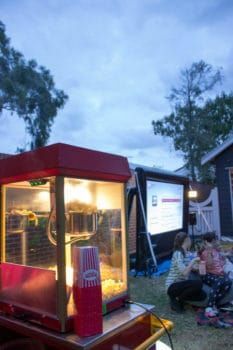 Consider adding popcorn machine and beanbags to make the backyard movie night both comfortable and catered for. Suggest backyard sleepovers and console game competitions on a big screen, on fresh air. Rent out a complete outdoor disco package – offer lights, decorations and accessories. Project music videos to a big inflatable screen, and maybe add microphones for karaoke! If you are considering starting or improving your party hire business, check the video below sharing our experience – we hope it will help your business shine!